Tshimong, a company owned by two Witsies, hosted the biggest high school debating league in Gauteng. A social development and education business, started by two Witsies, organised the biggest high school debating league in Gauteng which hosted its semifinals from August 26 to 27. 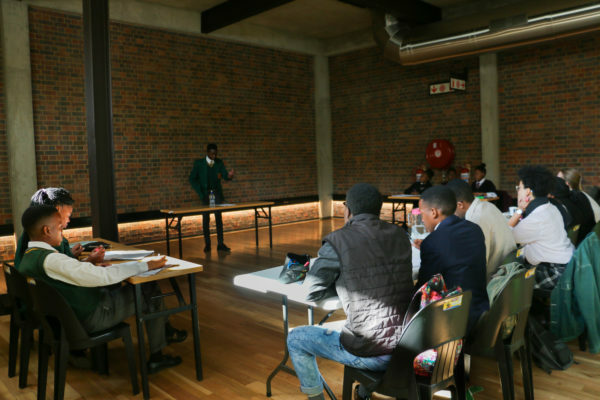 Tshimong, which was started by BA honours student, Bongani Masilela, and third year BA student, Thamsanqa Pooe, facilitated the Constitutional Hill Debating League at the Holocaust and Genocide Centre in Johannesburg. According to Masilela, Tshimong uses the values of a company or government department that sponsors it, and creates education and skills development programmes, through debating. This year the league incorporated 750 learners of all economic backgrounds from schools all around Johannesburg. This inclusion of disadvantaged learners is due to Masilela’s belief that it is important for businesses to “refine their business model and make it so that the everyday functioning of their business inevitably gives back to the community”. Pooe told Wits Vuvuzela that, “Debating has very unique academically related skills that it sharpens. It sharpens your critical thinking, argumentation, presentation and content generation skills on the spot. It broadens your general knowledge and puts you in a position where you constantly have to solve problems.” He added that opportunities to develop these skills are “very important for schools that are underprivileged”. Aobakwe Sephiri, a grade 11 learner at Randfontein High School, said he has benefited from the debating tournament organised by Tshimong. “This league has given me an opportunity to grow as a speaker. I realised this year that debating is a part of me. I really enjoy debating and engaging in very intellectual matters. I’ve gotten better as a speaker, especially in this tournament where I’ve been progressing,” said Sephiri. The league was divided into junior and senior divisions, with teams of three or four learners debating on matters such as the Rwandan genocide and human rights violations. Je Malepe Secondary School from Brakpan and Vorentoe High School located in Rossmore will be going through to the senior division finals. Rhodesfield High School from Kempton Park and Hoerskool Jan De Klerk from Krugersdorp will be competing in the junior division finals. The finals of the league will take place at Constitution Hill on October 14, with the junior division competing for a holiday leadership programme hosted on Robben Island. The senior division will be vying for a trip to Italy and job shadowing at Constitution Hill.